It is the top most layer of OSI Model. Manipulation of data(information) in various ways is done in this layer which enables user or software to get access to the network. Some services provided by this layer includes: E-Mail, transferring files, distributing the results to user, directory services, network resources, etc. 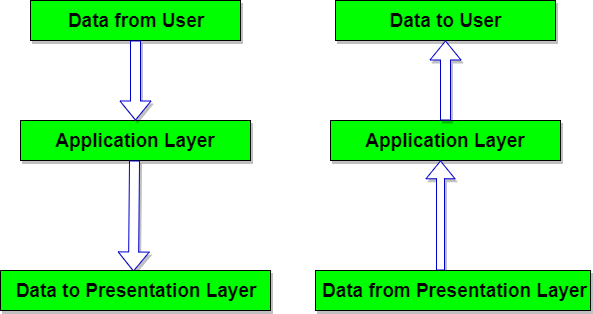 The Application Layer contains a variety of protocols that are commonly needed by users. One widely-used application protocol is HTTP(HyperText Transfer Protocol), which is the basis for the World Wide Web. When a browser wants a web page, it sends the name of the page it wants to the server using HTTP. The server then sends the page back. Other Application protocols that are used are: File Transfer Protocol(FTP), Trivial File Transfer Protocol(TFTP), Simple Mail Transfer Protocol(SMTP), TELNET, Domain Name System(DNS) etc. Mail Services: This layer provides the basis for E-mail forwarding and storage. Network Virtual Terminal: It allows a user to log on to a remote host. The application creates software emulation of a terminal at the remote host. User's computer talks to the software terminal which in turn talks to the host and vice versa. Then the remote host believes it is communicating with one of its own terminals and allows user to log on. Directory Services: This layer provides access for global information about various services. File Transfer, Access and Management (FTAM): It is a standard mechanism to access files and manages it. Users can access files in a remote computer and manage it. They can also retrieve files from a remote computer.